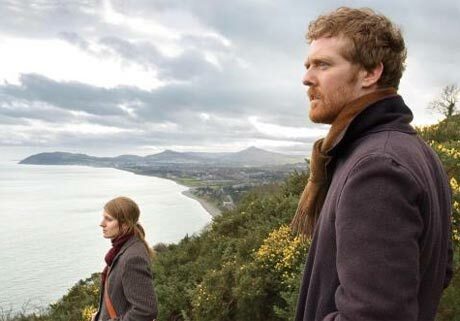 Starring two non-actor musicians (Glen Hansard and Markéta Irglová) and shot with digital handicams in natural light on a miniscule budget, writer-director John Carneys Once (on DVD Dec. 18) may be one of the best musicals ever made about making music. The out-of-nowhere Sundance hit is a heartfelt love story about music and its power to elate and impassion those who share it. The Guy (Glen Hansard, lead singer of the Frames) is a busker whos resigned himself to playing on the street corners of Dublin and fixing vacuum cleaners, now that his girlfriend has left him. The Girl (Markéta Irglová, with whom Hansard plays in real life in the Swell Season) is a Czech immigrant and musician who sees his true potential. They strike up a friendship and make beautiful music together. The film (out on DVD Dec. 18) splendidly conveys the magic of collaboration, the shared language of song, and the ephemeral joy of jamming. Thus, the DVD extras, including a director and actors commentary, a musicians commentary, and a making-of, deal primarily with how the filmmaking process was both helped and hindered by budget and improvisation in both script and resources, providing a road guide to making that rarest of filmic beasts, the unselfconscious musical. Plus: webisodes, free download. How does Ireland's musical culture inform the film and the way you chose to make it? Director Carney: Not every party in Ireland sees people breaking into song, but of course there is a tradition of singing and performing. I've always loved the notion of "party pieces, where everyone is encouraged to sing or play or recite a poem, and its such a shame [that] Irish people that we have allowed recorded music replace the live tradition. Maybe that scene at the party in Once will encourage people to give it a go at the next "seshoon they're at. What is it about watching musicians at work that you think has struck such a chord, as it were? The "montage has become so much a part of film grammar, that there is the temptation to show the passage of time in order to move plot along. This had its place in the 40s and 50s, but quite frankly is a little tiresome now. For me, this is exactly the type of cinematic fakery audiences are moving away from, which is perhaps why people have responded well to Once so far. Its nice to see how a thing is done, not just the end result. Besides the music, how much "jamming went into the performances?